One of the greatest things about this time of year for me is the food. The abundance of food. The smell of food, but most importantly, the love and joy that goes into making the food. There is something about being able to have those recipes that are tried and true from the kitchens of your mom, her mom, and her mom’s mom. I think that’s why I love Thanksgiving so much. When I became an adult, I realized that food was a source that brought families together. The movie Soul Food makes me happy – but only during the happier Sunday dinners. You know, where everyone comes around, and the table is covered with food and there is laughter, and instructions being yelled. I hosted my very first Thanksgiving one month after I got married. I was super nervous, but it started the love of hosting and cooking large meals. Being able to perfect my Granny’s macaroni and cheese, and finally being able to make my mom’s dressing makes my chest swell with pride. In these moments I know that I’m carrying on history for my children, and their children, and their children. Except, I also love adding little treats into my culinary aresnal every now and again. Earlier I showed you marshmallows that I made – just because – and now I have something that you can pair with those marshmallows on what’s to be very cold days, upcoming. This year, I’m focusing quite a bit on homemade holidays. I want to make more gifts from scratch – or as from scratch as I can, and we started with one of the things that always remind me that the holiday seasons are here. Hot chocolate. After making the marshmallows, we decided that we needed something for them to go into. I mean, they’re delicious, but way too sweet on their own. Thus, I wanted to make homemade hot chocolate (or hot cocoa – depends on where you live I guess.) 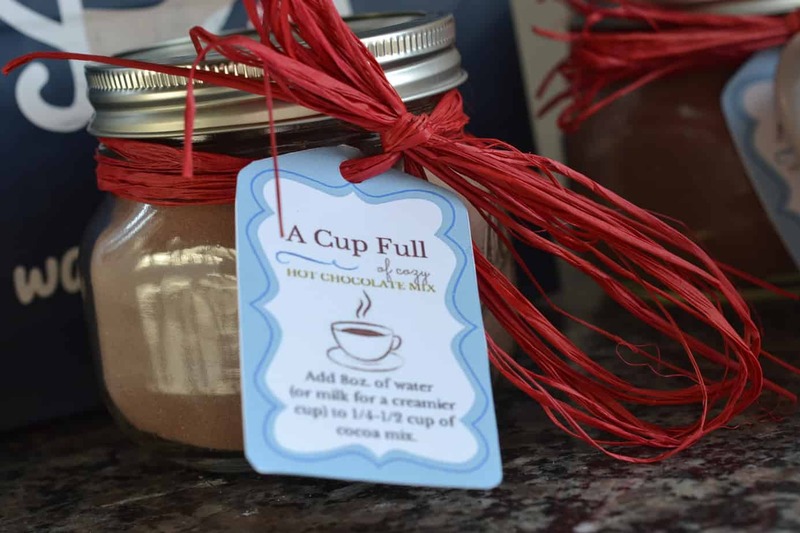 I’ll give you the recipe AND even give you tags that you can use to put on the hot chocolate jars that you’re bound to make to give out for the holiday season. 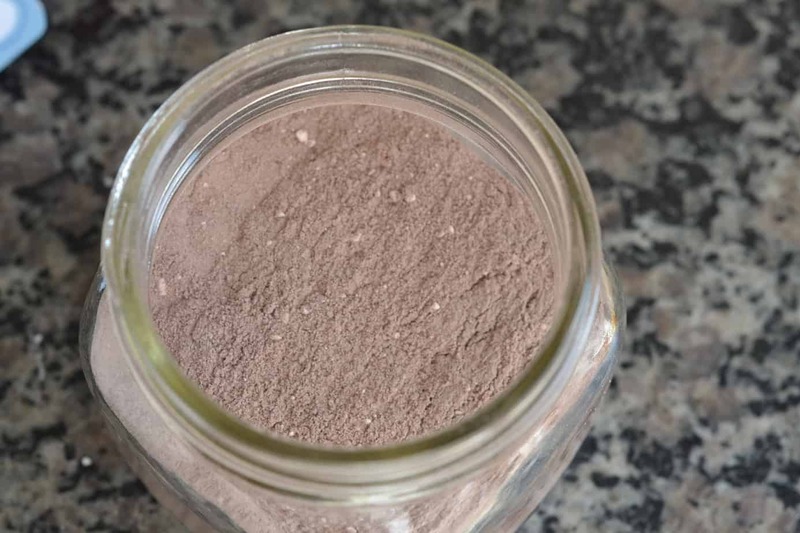 What you need for one batch which will make 2 pints – adjust as necessary, and so you know, I’ve totally swiped this recipe from Alton Brown – who retweeted me the other day, so we’re best friends now. His recipe calls for cayenne pepper to taste, but I’m not a fan of hot chocolate with it in there. Yes, I’ve had it. No it’s not spicy, it just has an extra kick. Mix all ingredients until they are evenly incorporated. It will keep indefinitely in an airtight container, but I”m sure you’ll find yourself making this more often than not. 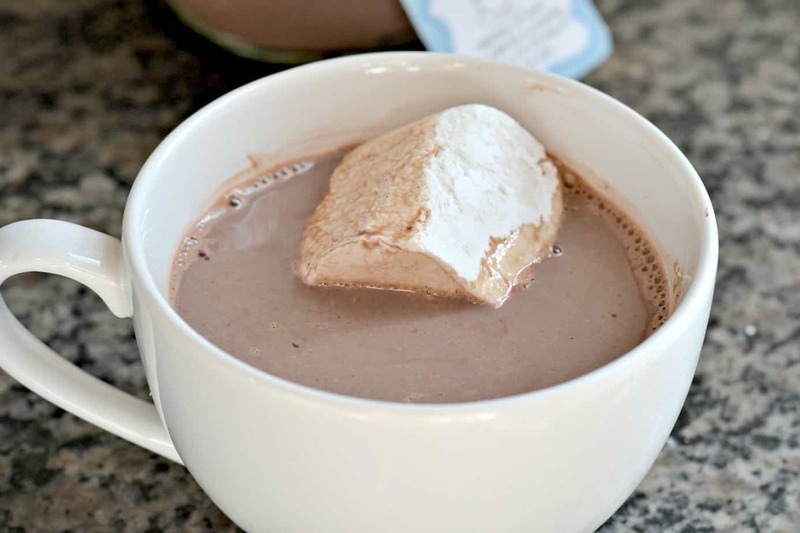 Fill your cup to the half point with the hot chocolate mix and add either hot water or milk for an extra richness. We’re purists here, so we pour on the extra milk. It’s divine, and the best thing on these chilly winter afternoons. Speaking of decorating, I consulted Mor Mor Baby (my mom) for some ideas on decorating these mason jars. I was going to go full fancy and wrap ribbon around the middles and she suggested I stay rustic with such an old time favorite. Thus we got raffia in red from JoAnn Fabrics & Crafts – they also had a deep purple, which I might go and pick up later. I also picked the mason jars up from JoAnn’s and they were surprised to see me there NOT getting fabric. It’s either awesome that everyone knows my name, or a sign of danger. These tags are the perfect addition to the jars, and we have them in both red and a perfect winter blue! Take your pick. You’ll have to print them out – I suggest a nice white or cream cardstock – and then cut them. If you have a tag punch you may be able to just punch them out. Hole punch them, and wrap as needed. Voila! Perfect holiday hostess gifts that take you no time! Just click the links below, and you’ll be able to print them out. 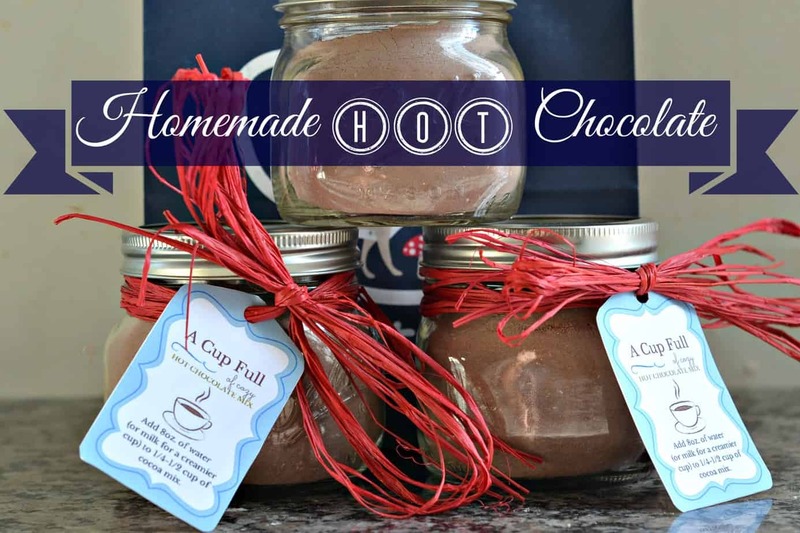 Have fun and make ALL of the hot chocolate mix! 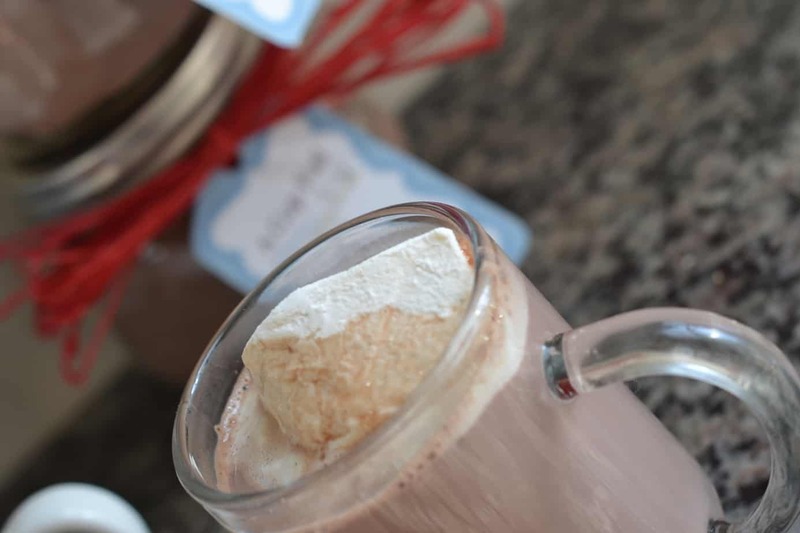 Pair it with a couple of the homemade marshmallows, and it’s a PERFECT small gift that you can make in large amounts. I love this. I’ve always wanted to do gifts like these and never get around to making them. But I’d kind of like to do them for myself, too. Yum! These are so cute!!! Hot Chocolate is one of our favorites during the holidays too. I’m going to make these and the marshmallows!! I love the raffia! This is so super cute Natasha. I think I may have to make them for clients for sure. Thanks! Perfect idea! Thanks so much for always sharing your thoughts, ‘experiments’ and the will to forge forward, o matter what. I absolutely adore this! What a great idea for gifting! Huh, I wonder if there’s a place I could go and buy a different kind of Container for these. Hmm.